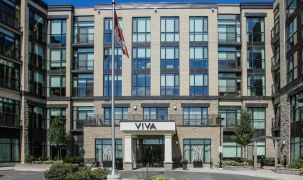 A superbly well-appointed Ottawa retirement home located close to the 417 in West Ottawa. 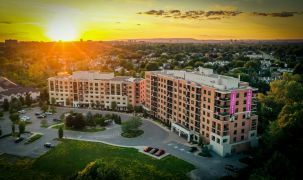 This is a lovely high-rise seniors' tower (17 floors) with great views from its balconies, and a variety of suite styles to select from. This residence still feels very new and clean throughout, but it's been established over ten years, and much of the staff has been here since it opened. People love the flexibility of living independently in your own apartment, as in any tower, combined with the option of sharing in dining or hiring care as needed. The Redwoods offers care up to assisted living, with dressing, bathing and feeding included. The Ottawa Ikea is nearby, as are banks, churches and a variety of health care services. Kids from local schools drop in for day visits and interact with residents through activities like a reading buddy program. 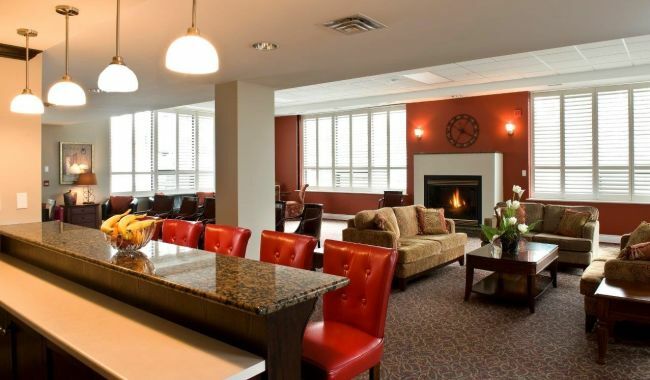 For all of the friendliness and great care, there are also a wealth of exciting amenities, including chef-prepared meals, a heated indoor saltwater pool, a wellness program, a pub, and more. Ottawa offers many retirement living options but few of them as stable as The Redwoods. In an industry susceptible to staff turnover, the Redwoods rightly boasts about staff retention and how happy people are working here. This can be very important for seniors in care, who like to know the person giving them care. Staff have a chance to grow familiar with residents, readily remembering names and personal preferences. The personal familiarity among serving staff, nursing staff, personal support workers and reception staff, who have often worked together for years, also benefits the whole community. 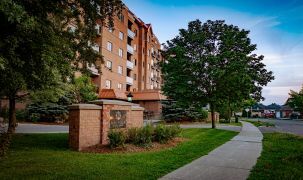 The Redwoods is ideal for Ottawa-area seniors who want the best in life, living in community with other seniors, close to family in Kanata, Nepean or elsewhere in the west end of Ottawa. For seniors who have had a health scare, or who simply want to make housework a thing of the past, this is the perfect environment in which to settle. Onsite fun includes movie nights, card games, shuffleboard, billiards and more. This community is pet-friendly, with its own onsite canine mascot. I have only been here a few days but it has been very positive. Everyone is very friendly. All my requests to staff were handled promptly and efficiently. Mum enjoys the meals, which are a good variety and sensible portions. The housekeeping staff are wonderful and come in daily to see if she needs anything. She also gets help with her shower. [She had a complaint and] staff offered her help which proved satisfactory… My sisters and I are relieved that she is in a retirement home that she likes and in which she feels well taken care of. There’s a lot of activities, something going on most of the time. You’re always welcome at anything. The thing I like best about the Redwoods is the staff, the people. They create such a nice, welcoming, friendly atmosphere. I also like that I have my own full kitchen. That really makes it a home for me.